We are very pleased to announce that Oxygene has a new partner in the shape of Adaptive Ski Adventures. Oxygene has been dedicated to making skiing accessible to all, but without organisations and companies singing our praises and promoting adaptive skiing, we wouldn’t get very far. We are thrilled to welcome Adaptive Ski Adventures into the Oxygene Family and we are extremely excited about the coming season. We hope that together we can offer more disabled people the thrills (and spills!) of snowsports. Skiing really is the most adaptive sport available to people with disabilities. We asked company Directors, Ryan and Martyn to give us the low-down on their company and here is what they said. What makes Adaptive Ski Adventures different from other Adaptive ski companies or associations? Our mission at “ASA” is to open the sport of skiing to everyone. Whilst other firms dabble in adaptive ski options as a side-line to their main business, we specialise. Our consultants have first-hand experience of the equipment, the resorts and the difficulties involved in arranging a ski holiday for someone with disabilities. Considerable research has been undertaken before selecting what we consider to be the two best resorts for adaptive ski holidays, insuring access to highly trained experienced instructors using the most advanced equipment available. We offer tailor made packages to suit the needs of our clients and a personalised service to ensure that all needs are catered for. Why are we at Oxygène so excited about this new venture? Oxygène has been at the forefront of adaptive skiing for a few years now. Belle Plagne Director, Julien Favre’s passion and focus on the project has inspired a whole generation of Oxygene instructors to become involved in adaptive skiing. 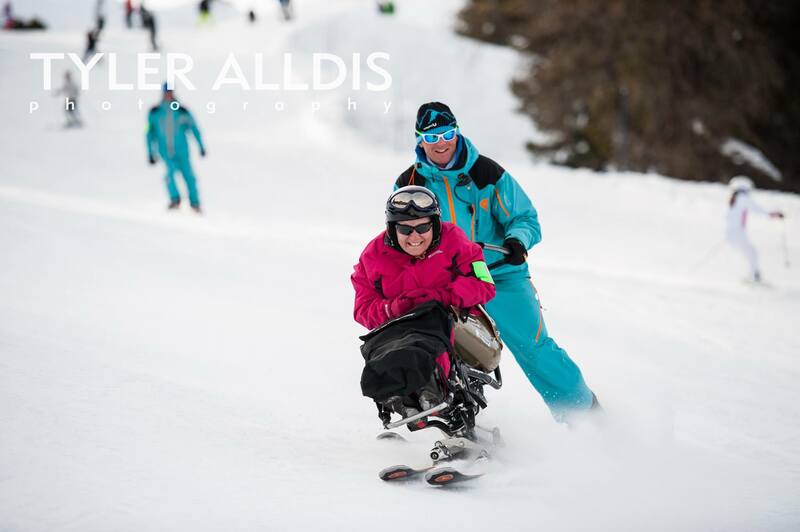 We know from experience that there is a huge demand for adaptive skiing and that there are increasingly groups of people who have a disabled family member, or friend who’d love to come on a ski holiday but havn’t found the right people to help them organise their trip. Whilst there are a lot of charitable organisations who offer incredible ski options, some disabled people just fancy a ski trip with their mates or family. This is where Adaptive Ski Adventures differs from the rest, and one of the many reasons why Oxygène are so excited. Adaptive skiing is no longer something only available through charitable organisations and groups. Who are Adaptive Ski Adventures aimed at? Anyone who wants to experience the thrill of winter sports but are restricted by disabilities. Without limitation, these may include disabled community groups, School’s with disabled children, disabled veterans and all non-skier leisure activities. We cater for the elderly, cerebral palsy, amputee, autism, deaf and hearing impaired, epilepsy, blind and visually impaired, Addison’s disease, cancer, Parkinson’s, paraplegic, downs syndrome, multiple sclerosis. What does Oxygène do for Adaptive Ski Adventures? Oxygène provides ASA with the security of knowing that our clients will have the best experience possible on the snow.We have found Oxygène instructors to be highly qualified, experienced, friendly and English speaking. The extent and standard of equipment available is second to none and provides an extensive range of options. Why have Adaptive Ski Adventures chosen to work with Oxygène? Oxygène are a highly professional organisation with a commitment to Adaptive ski solutions. From our research and experience we can see that Oxygène are clearly market leaders in this field possessing the a vast number of highly qualified instructors with an extensive knowledge of both La Plagne and Val D’Isère. Our clients safety and enjoyment is paramount to us and we have absolute confidence that the team at Oxygène will surpass our clients expectations.